Oh, Idaho! is a sweet and eclectic sounding compilation by three teens from Lexington, KY. Filled with 7 easy to listen and very diverse indie pop/rock, this debut compilation is a great listen. It features a great mix of indie pop vocals, quirky sounding vocals and pretty cool and catchy rhythm. Tense Kids is made up of Alex John and Joe Harbison. They’re joined together by Eric Myers, Kyle Randall, Allen Shariaty, Dimitri Lozovoy and Aaron Graham. The group formed in late 2008 and spearheaded by Harbison, who also has several albums under his name. His songs are available for download here. If you want to listen to a fun album that ingeniously incorporates jazz, pop, indie elements with quirky lyrics to match; then you should have this record with you. It’s all that and more. Oh, Idaho! starts off with Letters to Andrew (Three Weeks In), which is an acoustic indie pop rock affair that features clear vocals and nice blending. 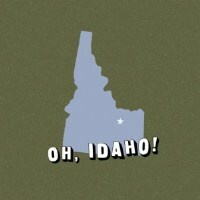 Title track, Oh, Idaho! showcases an upbeat rhythm; making it a fun listen. There’s an acapella portion near the end part of the song with nothing but hand claps and singing which adds to the rawness of the track. It’s capped off with a gorgeous piano ending. Second Law is among my most loved tracks. The jazz infused track is relaxing and has a spunky personality. Another easy favorite is Rachel King and the Waiting Room Questionnaire. For some reason, this track reminds me of a Mexican dance. The vocals are fantastic and very entertaining. These Kentucky natives certainly know how to deliver. Each of their tracks is creative and adds plenty of interest wherever you listen. Their cool use of instruments and voice adds variety providing unexpected moments everywhere. Oh, Idaho! is nothing but creative energy balled up and released everywhere; making everyone smile and happy. Everytime I try to download it brings me to Download torrents …what is the point of this. There is nothing to agree and I am not going read all of this junk what is it for?